The goal is to give "the next generation of robotics researchers" a cross-subject understanding of artificial intelligence, computer science, machine learning, sensing and signal processing, mechanical engineering and other advanced topics. Four of the Fulton schools are involved in the new program: the Polytechnic School; the School for Engineering of Matter, Transport and Energy; the School of Computing, Informatics and Decision Systems Engineering; and the School of Electrical, Computer and Energy Engineering. The robotics aspects of the program include autonomous vehicles, biologically-inspired mechatronics, household robotics, multi-agent systems, robot-aided neurorehabilitation, soft robotics, swarm robotics, unmanned vehicles and wearable assistive devices. "We created the program because we need to train more people to overcome the current shortage of qualified personnel within robotics and autonomous systems," said Lina Karam, a professor of electrical engineering, in an article about the launch. "Students need a breadth of knowledge to create the next generation of technologies that can have a significant impact on our economy and quality of life." Among the new students in the first cohort is Alex Goldman, who said he was drawn to the graduate program for its interdisciplinary focus. Goldman has a mechanical engineering degree from the University of Michigan and intends to specialize in aerospace and mechanical engineering. But he noted that he's also excited about being able to pursue classes in other disciplines, which include advanced system modeling and mechatronics device innovation, computer-controlled systems and human-aware robotics. Tied to his personal interest in scuba diving, Goldman intends to conduct research "at the intersection of robotics and water." For example, in one of his courses, he expects to work with a doctoral researcher who is designing an autonomous vehicle to detect microplastics in Tempe Town Lake near Arizona State's Tempe campus. He's also looking forward to working with professors who are designing octopus-inspired autonomous arms and autonomous water vehicles. "I'm really excited to be a part of the first class of people getting into the program and being a part of what I think will be a much bigger program pretty soon," he said. 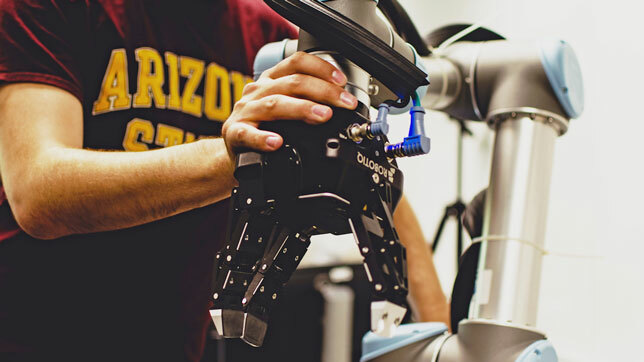 "In the future, we're going to be interacting with intelligent machines a lot in our everyday lives," said Panos Artemiadis, the graduate program chair for the new program and an associate professor of aerospace and mechanical engineering. "We need to make sure people understand how to design, build and control the intelligent machines that will ultimately make our lives easier."